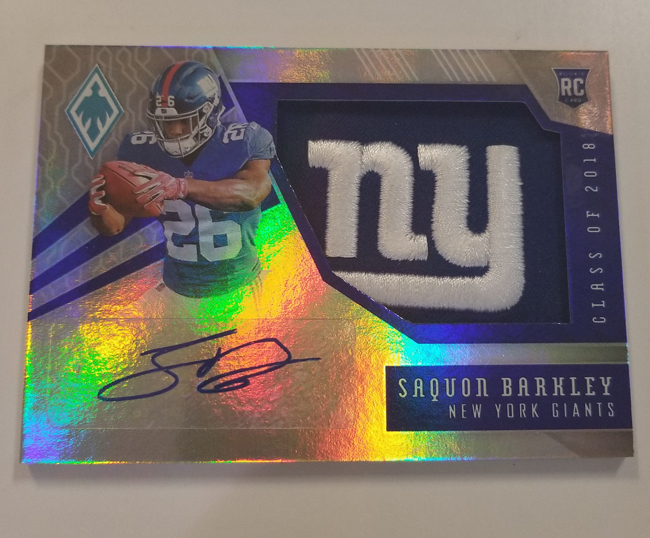 Arriving this Wednesday at Sports Cards Plus, a.k.a. 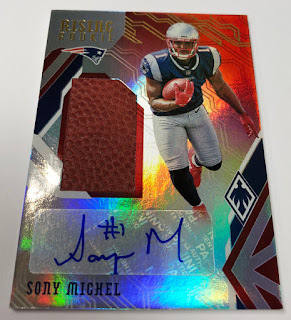 This Super Hit Factory is 2018 Panini Phoenix Football ($112 per box) with a checklist full of key Rookie Cards and build-worthy parallel sets. The product’s first two iterations — 2016 and 2017 — have helped solidify the brand as a key and colorful early season fixture. The 2016 and 2017 Phoenix boxes currently sell for $135 to 156 per box, so buy your box of Phoenix early to insure the low price of just $112. 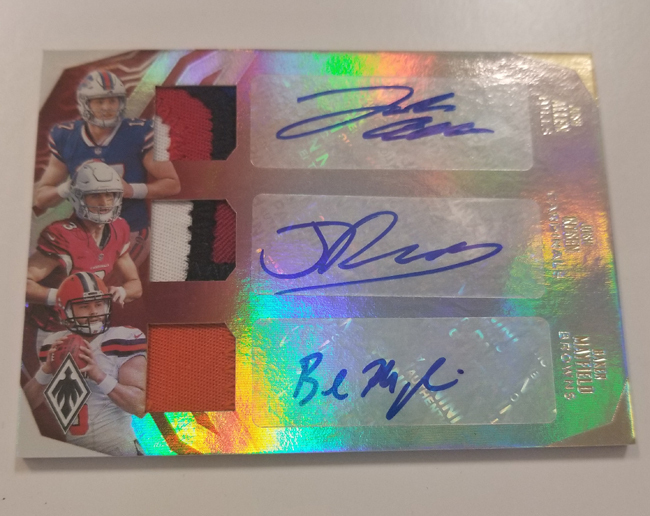 On average, each hobby box of 2018 Phoenix Football (five cards per pack, 12 packs per box) will deliver two autographs, one memorabilia card, 12 parallels, 12 Rookie Cards and nine inserts. The product includes special Color Burst Hot Packs (one per box, on average) that include vivid variations of base cards, RCs and inserts. 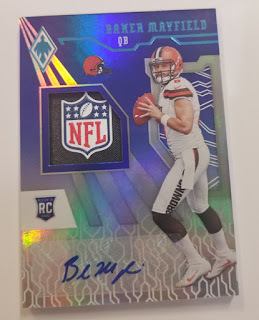 Additional highlights of 2018 Phoenix Football include . . .
Chase the most in-demand autographs of the 2018 NFL Rookie Class in the RPS Rookie Auto Jersey, RPS Rookie Jumbo Auto and Rising Rookie Material Signatures inserts. 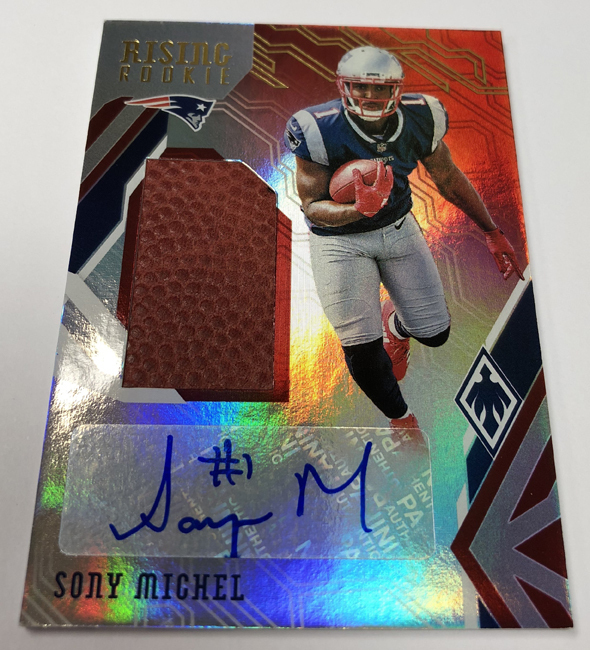 Find rare Prime versions of these cards and special versions of Rising Rookie that feature pieces of gloves, helmet and NFL footballs. 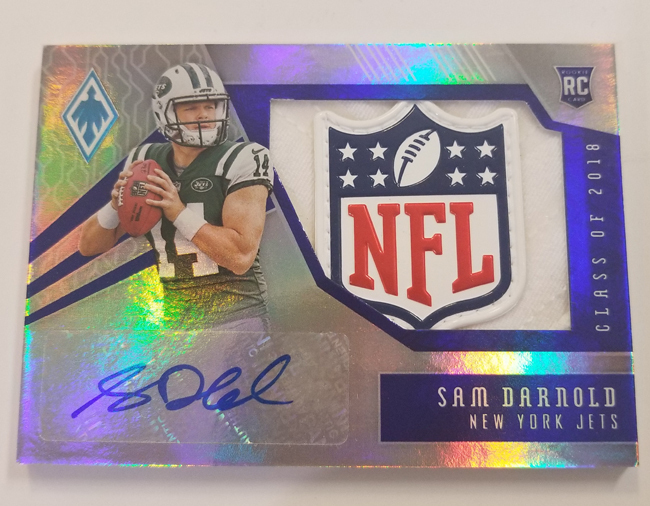 Jumbo pieces of authentic NFL memorabilia in RPS Memorabilia, Jumbo Memorabilia and Veteran Materials; these inserts feature some of the top players in the NFL and contain parallels as rare as Super Prime 1/1. 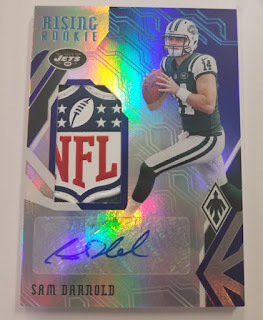 NFL Shield 1/1 versions of RPS Rookie Auto Jersey, Jumbo Auto Swatch and Rising Rookie Material Signatures. The 200-card base set (including 100 rookies) features Red (numbered to 299), Pink (numbered to 199), Purple (numbered to 149), Orange (numbered to 99), Yellow (numbered to 75), Green(numbered to 25), Black (numbered to 10) and Blue 1/1 parallel versions. 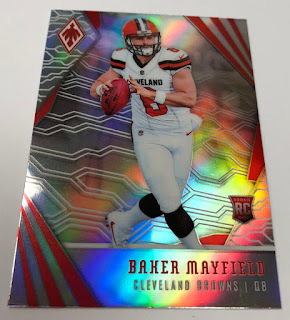 Look for the following Color Burst versions: Base (1:6 packs), Rookies (1:6 packs), QB Vision (1:40 packs), Unmatched (1:40 packs), Adrenaline Rush (1:60 packs), Agility (1:120 packs) and Most Valuable (1:120 packs).